Uncategorized Category Archives — Texas Oil and Gas Attorney Blog Published by Texas Oil and Gas Lawyer — Aimee Hess P.C. Recently, the U.S. Geological Survey published a new assessment of oil and gas reserves in the Permian Basin in Texas and New Mexico. 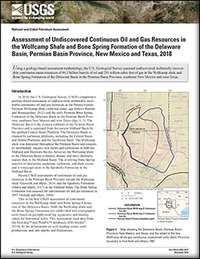 The assessment, that you can read here, reports undiscovered, technically recoverable, continuous mean resources of 46.3 billion barrels of oil and 281 trillion cubic feet of gas in the Wolfcamp shale and Bone Spring Formation of the Delaware Basin in the Permian Basin Province, southeast New Mexico and west Texas. This means these reserves are the largest in the world. At the end of 2017, total reserves in the United States were estimated to be 40 billion barrels of crude oil and 465 trillion cubic feet of natural gas. This new assessment therefore reflects a doubling of U.S. crude reserves and a 65% increase in gas reserves. As these reserves are produced, the economy will benefit in several ways. Mineral owners will be paid royalties. New employees will be hired by oil companies. Tax revenues to local, state and the federal government will increase. A recent opinion by the Fifth Circuit Court of Appeals addressed a claim by royalty owners that Devon Energy Production Company LP violated its implied duty to market arising from their oil and gas leases with Devon in the Barnett Shale area. That case is Seeligson et al v. Devon Energy Production Company LP (Case 17-10320 October 16, 2018 Unpublished). The royalty owners/lessors were attempting to obtain class-action certification. As part of their evidence, they showed that Devon sold the gas produced from their wells to a Devon affiliate for a price of 82.5% of the published industry index value of the residue gas and natural gas liquids. The evidence also showed that payment was never made by Devon to its affiliate. In addition, the affiliate “charged” Devon 17.5% of the value of the gas as a processing fee which was claimed to be substantially higher than the current market rate for processing gas. Again, no money actually changed hands between Devon and its affiliate. The royalty owners claimed that this was a sham transaction that resulted in their receiving lower royalty payments than they would have had Devon paid the market price for the gas produced from their wells. The District Court certified the Plaintiffs’ claims as a class action and Devon appealed. The Fifth Circuit held that the class certification was not an abuse of discretion by the District Court, but that the District Court had failed to consider the effect of potential statute of limitation defenses by Devon on the class certification. As a result, the case was sent back to the District Court to examine the effect of these to defenses on class certification. The oil and gas production industry operates in a tough position. On the one hand, oil and gas production are critical economic drivers in the United States. Oil and gas generates hundreds of thousands of jobs and contributes 8% of the U.S. Gross Domestic Product, according to the American Petroleum Institute. On the other hand, the Texas oil and gas industry is constantly grappling with environmental concerns and the threat of even more regulation of their activities by the Texas Railroad Commission and the federal Environmental Protection Agency. The oil and gas industry is already highly regulated, and yet state and federal government agencies consistently add more regulations on top of those that already exist. One of the recent set of regulations that the industry is facing are rules issued by the EPA concerning reducing methane emissions. The reasons behind state and federal regulations are often good ones, for instance, concerns about air quality. On the other hand, some regulations are too far-reaching and overly aggressive. For example, where regulations require the adaptation of new technology designed to be cleaner and more environmentally conscious, the high cost of implementing those regulations can force smaller oil and gas producers out of business. That means fewer jobs and a decrease in taxes on oil and gas production that are paid to local governments. Another problem, with federal regulations in particular, is that they are often based on faulty (and sometimes nonexistent) science and take a one-size fits all approach that does not take into account local conditions, technologies and regulations. We end up with a mess! Environmental groups in a number of states are pushing for ballot initiatives to ban or limit drilling for oil and gas. Most reasonable people, and I believe many oil and gas companies, agree that regulations are appropriate, especially for drilling in environmentally sensitive areas or near residential developments. But few people proposing outright bans or overly restrictive regulation discuss or even acknowledge the unintended consequences of such a course of action. For one thing, many people do not realize that the vast majority of mineral owners are just regular individuals, some of whom depend on royalty income for retirement. A drilling ban or overly restrictive regulation can deprive some people of much needed income. Are the proponents of drilling bans prepared to replace that income or to pay additional taxes to support welfare payments to those people who need their royalties so they can pay their rent and eat? Secondly, according to the U S and state constitutions and the legal principle of inverse condemnation, if government regulation deprives someone of their property, then the government is required to pay the owner the market value of that property. Individuals in this country own billions of dollars worth of mineral interests. A recent study in Colorado estimated the value of unproduced oil and royalties to mineral owners in that state to be $26 billion. Are taxpayers ready for higher taxes when their local or state government has to start paying these claims? In two recent cases, the Texas Supreme Court reviewed what are called “retained acreage” clauses in gas and oil leases. Consistent with recent precedent, the Court instructs that these clauses are to be interpreted based on the language used and that the intent of the parties is to be the guiding principle. In Endeavor Energy Resources, L.P. v. Discovery Operating Inc., the conflict involved the interpretation of so-called “retained acreage” clauses where the parties intended the retained-acreage definition to be based on the plats filed with the Texas Railroad Commission (“RRC”). The Court also decided a companion case, XOG Operating LLC v. Chesapeake Exploration LP, that came to a different conclusion. The difference between the cases hinges on the language in the leases. We will discuss XOG separately. In the case of ConocoPhillips Co. v. Koopmann the Texas Supreme Court held that the Rule Against Perpetuities (“the Rule”) did not void a 15-year non-participating royalty interest that was reserved in a deed. In doing so, the Court changed the way the Rule applies to oil and gas deeds. The Supreme Court rejected the long-held distinction of a future interest created via reservation versus one created via grant in the oil and gas context. A January 2018 case from the Texas Supreme Court, JP Morgan Chase Bank, N.A. v. Orca Assets GP, LLC, the Court dealt with justifiable reliance which is an element of a common law fraud and negligent misrepresentation claim. In this case, there were too many “red flags” for the plaintiff to show justifiable reliance with respect to certain oil and gas leases. This case involved mineral interests in various tracts throughout the Eagle Ford Shale adding up to about 40,000 acres owned by The Red Crest Trust. JP Morgan Chase Bank was the trustee. A JP Morgan employee, Phillip Mettham, was responsible for leasing the trust’s Eagle Ford interests.